It's getting darker sooner - are you prepared for early morning and nighttime running in the fall and winter months? Join us for a free night fun run on Wednesday, October 8th at 7pm. 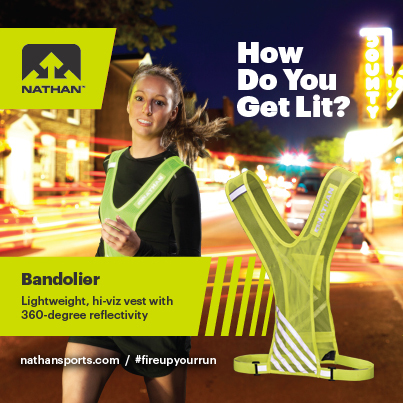 Bring your current visibility and reflective gear and demo some of the newest products from Nathan Performance Gear. Run or walk as much or as little as you'd like - most will go 3 - 4 miles and join us for a short safety clinic. Those in attendance will have the chance to win some FREE SWAG! RSVP below - hope you can join us!